During a notorious career with the Detroit Red Wings and the Chicago Blackhawks, Bob Probert racked up points, penalty minutes and bar bills, establishing himself as one of the most feared enforcers in the history of the NHL. On the ice, he was a fan favourite. He backed up his teammates one hundred percent, taking on the toughest guys of his era. Off the ice, Probert played hard too. Over his pro career he went through ten stays in rehab, two NHL suspensions, a jail sentence for carrying cocaine across the border and a near fatal motorcycle crash. When he died unexpectedly of a heart attack on July 5, 2010, at the age of forty-five, he was hard at work on his memoir with Kirstie McLellan Day, co-author with Theo Fleury of the blockbuster Playing with Fire. 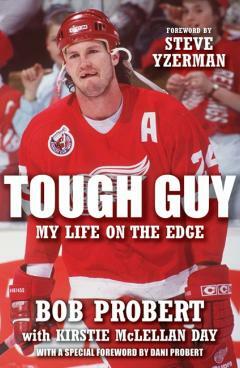 Probert wanted to tell his story in his own words to set the record straight. Tough Guy is a gripping journey, full of jaw-dropping stories about Bob’s on-ice battles and his reckless off-ice encounters with drugs, alcohol, customs officials, police, courts and the NHL. Probert’s opponents often feared him, but they always respected the man beneath the bloodied jersey. With his unique sense of humour and inside stories, Probert gives us a first-hand account of his adrenalin-fuelled life as the toughest fighter in the NHL.